Some news about the second-gen Peugeot 3008 – the all-new SUV, which was unveiled in May, is slated for Malaysia, and word from the grapevine is that it’s expected to enter the market here sometime in the second quarter of next year. From a variant viewpoint, it’s the petrol route again, with the 1.6L THP 165 S&S six-speed auto looking to be a certainty. No word as to whether the 1.2L PureTech 130 S&S variant is being considered, but pointers are that the powertrain might make it here, albeit via other carriers. Pricing – even indicative – hasn’t been intimated, but things are likely to progress from that asked currently for the first-gen facelift, which is RM159k. Buyers will have plenty to look forward to, especially a premium interior that looks far better to the eye than photos suggest. The cabin features a swanky-looking i-Cockpit dashboard design, and new materials and trim dress the space up in a manner that puts some offerings from premium brands to shame. Novelties include a centrally-mounted eight-inch touchscreen, six elegant piano-key toggle switches, which offer direct and access to the main control functions (radio, climate control, navigation, vehicle parameters, telephone and mobile applications), but the visual standout is a high-resolution 12.3-inch display screen that makes up the instrument cluster. Configurable, five different display modes are on offer, all controllable via a knob on the steering wheel, allowing the driver to personalise the instrument readout to preference. Still early days, so no indication as to the level of kit that the MY-spec will have as yet, but there’s a plethora of items available from a specification viewpoint, with bits including a panoramic sunroof and a hands-free tailgate, and on the options list is a 10-speaker Focal Premium hi-fi audio system as well as a Driver Sport Pack. gorgeous cars priced wrongly and problematic too. but i like it. its french! It is fabulous looking and highly equipped but lacking the after sales support – logistics wise and quality. I tot now Peugeot not in Malaysia anymore? The one in seremban already closed shop. good car but lazy, malas dealer in Malaysia. All they know is tidur. Seremban is not the only city in Malaysia bro.. There are lots of good service centre across malaysia that provide excellent after sales service. Mine 508 very good with zero problem, already 3 years at 71k mileage. poor resale value though it’s a nice SUV. Can’t take the depreciation? go buy a Myvi. with Pugs, tow truck and SC are your speed dial, period! The PSA cars have their own unique style and quality to match the Germans. Beautiful car coming out of France let down by bad management and service support here in Malaysia. The constant stories of nightmare service failures suffered by current Peugeot owners, especially in Glen Marie, are driving serious potential customers away from the marque. Glenmarie I don’t know, my place no complain. Park this Pug beside a CX-5/CR-V/X-trail/Tucson/Sportage, many will agree that this Pug look better in the inside especially those cossetting soft leather with cross stitching body hugging seats. In fact, many will even go on to say that it is better than the Germans when comes to seats. In terms of power, equipments, gadgets & novelties, its on par with most car manufacturer’s in this segment. Has the air-cond problem (almost every part of the air-cond system is problematic) solved already? Even need to dismantle the whole dashboard out just to replace the ever problematic cooling coil… besides the already problematic air-cond compressor. Another problem is the engine is super sensitive to fuel quality issue n during super-hot climate season here. However, despite all these issues; i still love this car n brand. What air cond issue? Mine 508 has no air cond issue after 3 years 71k. not settle. my peugeot compressor kaput after 4 years. but by the way, still acceptable la the compressor price, rm1.7k all in (peugeot 508, 208 and 2008 model. same compressor). other model i dunno. my car now 140k mileage and still going strong like new. only at first buy got some sensor error then fixed at sc (mine first batch model). cooling coil wise, all car the same mah. need to dismantle everything to change/cleanup. Can this SUV compete with new cr-v and cx-5 next year? Nice and good car but No resale value,Poor after sales service, Poor technician with technical & knowledge background. 100% agreed. Very poor after sales service. Does it comes with the ‘famous’ kuaci packet sized glove-box? I know what used car to add into my consideration 3 years from now.. should be below 90 by then….pls buy a few early adopters..so that i can own it down the road after u take the hit…there’s always a good side to bad rv..for the next owner …. :) keep it until it’s just enough for a downpayment for my next ‘exotic’ wheels….blissfull…. Enjoy while you can for the 1st to 3rd year. After that you will experience different kind of problems. Be prepared. Every car after 4 yrs or 120k km will come up with issues. It seems to me peugeot is like the brand everyone loves to hate. My family members have been using peugeot since the 405 and they are still strong with the brand. The dealers also have come a long way from what they were and for a fact i know that they are indeed making huge efforts for the long run. But still if car is just a tool for you then this sir is not your brand. As a fellow Pug owner whose unfortunate enough to be involved in a severe accident and walked away without s scratch (touch wood) this brand is something i strongly advocate and wont be going japanese anytime soon. To be honest youre getting ripped off with a japanese car mate with a long list of substandard tech and equipment. If you choose to prioritize the next owner (resale) more than yours and your loved ones life, then without a doubt Peugeot is not for you. The immediate reaction everyone has with Peugeot is generic, bad aftersales and bad resale. As a Peugeot Owner, i have 4 dealers nationwide that i constantly go to and I get my services and claims done promptly. I believe its the Malaysian kiasu sense of entitlement that causes a poor service, but thats my opinion. Be nice to your service advisor Im sure they will go above and beyond with your car. The dealers are also working on some long term solutions to current shortcomings and it shows. From what i have heard they are taking things to the next level with the aftersales. On a side note, i recommend Setia Alam for klang / shah alam side, and CS Euro Butterworth in North for your service needs. Safety, peugeot always finishes at the top of the table. I cannot comprehend how malaysians are willing to gamble theirs and their loved ones lives with inferior cars in terms of active and passive safety. Many peugeot owners, me including have had close calls and are very thankful for our cars in keeping us safe. 5k to 8k extra after 5 year resale is NOT a price worth gambling with safety, EVER. Well at least for me. Peugeots a fun guys, if you have nvr driven one drive it. I dont have to type anything more on this. Test the 308, 408 and 208 and see if you dont get poisoned. Been using a pug for a two year plus and they have vastly improved customer service and parts availability within reasonable time. More importantly, all those nonsense about resale value is junk compared to the value of my family life. My wife involved in accident, hilux ruin out back of my Peg208 at traffic light without stopping in red light. Seriously damaged at rear and almost deploy airbag,but my Peg save my wife life more importantly without single injury.Can’t say much about other cars but there is a sense of safety and stability being in my 208 than what I feel in other car makes of similar price(previously using local and Japanese cars). The customer service very responsive and fast enough to do claim and repair including provide courtesy car to be used during repair and restore period(Peugeot Jelutung Brach,Penang).Thanks to their dedication staff that handle the matter very well with responsive solution. and not forget to Peg distributor for bring in this French awards winning to Malaysia. Been using a pug for a two year plus and they have vastly improved customer service and parts availability within reasonable time. More importantly, all those nonsense about resale value is junk compared to the value of my family life. My wife involved in accident, hilux ruin out back of my Peg208 at traffic light without stopping in red light. Seriously damaged at rear and almost deploy airbag, but my Peg save my wife life more importantly without single injury. Can’t say much about other cars but there is a sense of safety and stability being in my 208 than what I feel in other car makes of similar price (previously using local and Japanese cars). The customer service very responsive and fast enough to do claim and repair including provide courtesy car to be used during repair and restore period (Peugeot Jelutung Brach,Penang).Thanks to their dedication staffs that handle the matter very well with responsive solution and not forget to Peg distributor for bring in this French awards winning beauty and beast to Malaysia. Been using a pug for a two year plus and they have vastly improved customer service and parts availability within reasonable time. The car full loaded with all the latest future safety that can’t been beat by other car maker. More importantly, all those nonsense about resale value is junk compared to the value of my family life. My wife involved in accident, hilux ruin out back of my Peg208 at traffic light without stopping in red light. Seriously damaged at rear and almost deploy airbag, but my Peg save my wife life more importantly without single injury. Can’t say much about other cars but there is a sense of safety and stability being in my 208 than what I feel in other car makes of similar price (previously using local and Japanese cars). Distributor need to bring down the price to make others affordable to own Peg. I still remembered 35 years ago my cikgu driving a lion to school everyday…. Test 508 also lah, very goody … My service center also very good but I wont tell you where else ppl swarm them with problems, haha. Unique n Beautiful. But prev. exp. owning Peugeot is a kill. To all those still stereotyping and doubting Peugeot, please wake up. Not trying to be rude but we’re in 2016 now and Peugeot has vastly improved, their service, parts and most definitely the quality and drive of the cars, I own a 2015 Peugeot 308, it rides like a dream, it handles amazingly, anywhere I go it is just a car that is worth every single bit of the 140k price tag. 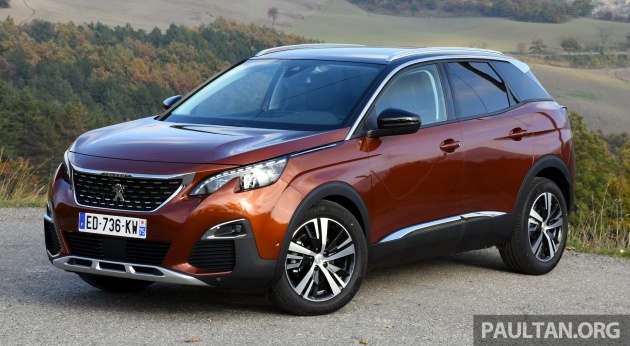 I have really high hopes for this 3008 and will probably buy it if it is priced reasonably, in my opinion this car is worth the money even if it is priced at 170k, see it as a premium option, or perhaps an affordable European car that is definitely on par with the Germans. Don’t take my word for it though as I haven’t driven it yet, but if you have the time check out these video reviews of it. yes, you are right. I am perfectly satisfied with my continental quality car, i.e Peugeot 508 3 years at 71K for the price of a equivalent jap. Been driving the 208gti for the past 2 years. Fortunately I have been blessed with awesome service centre nearby to assist me whenever a glitch comes up. It’s solid, the built quality is good, and it’s a damn good car. its not fair for those who bash the Peugeot brand based on “hearsay” the service is bad. I’ve personally been through the after sales service and I have no better words for them except excellent. If you are worried about the parts being costly, mind you Peugeot is a continental car. A very exciting year ahead with all the new models. Can’t wait for it to be launched ! !